I wish you made a tilted stand. I made one and it is perfect for on stage. dvhb27 wrote: I wish you made a tilted stand. I made one and it is perfect for on stage. Not sure what you mean by a tilted stand but I made a mount that works for me when I am sitting. 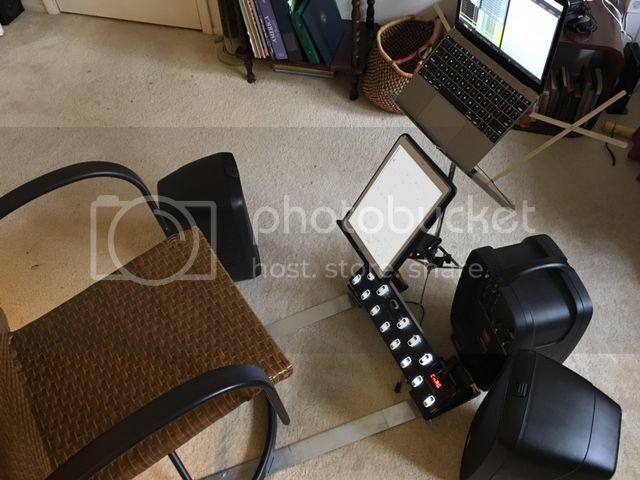 My requirements were to be lightweight, portable, and fully adjustable along with giving me the ability to see the 12 step and operate it with my foot or feet while I play my wind controller sitting. I used a $7 pair of folding plastic wheel chocks (amazon), aluminum strips and square bar plus two small bolts and washers. Got most from Home Depot. I put aluminum square bars behind the 12 step (to eliminate flexing the 12 step) and wire tied it to the chocks and it is just the right angle and height off the floor so i can see it while I read music on an iPad which is mounted on a stand just above the 12 step. I put a rubber mat over the strips to keep my heal from wearing the carpet. I can see both my foot and the music at the same time. 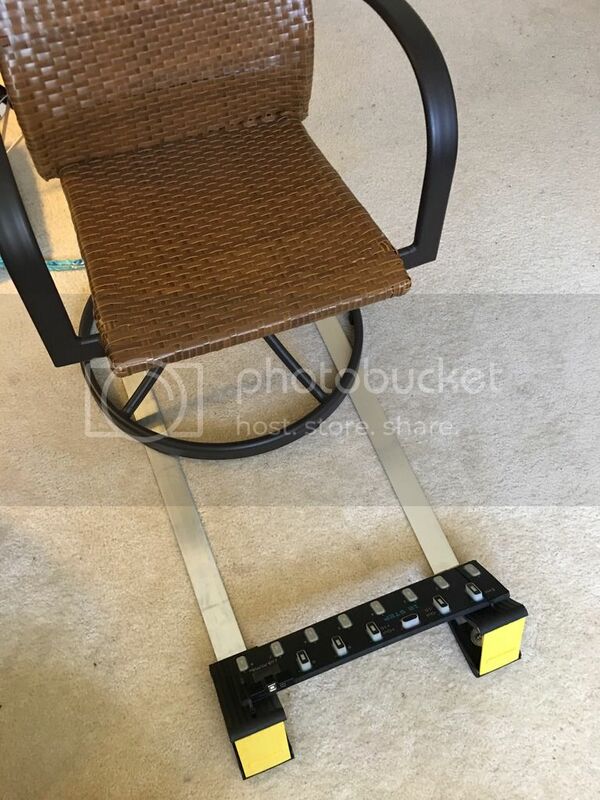 The chair sits on top of the aluminum strips which are bolted to the bottom of the chocks so nothing moves when I press the keys and it stays in the same place so I can begin to train my foot to know where the keys are without having to look. This is what happens on a piano with your hands and the keys are in the same place each time. Likewise the 12 step has to be in the same place each time so I drew lines on the flat bars so I will put it back in the same position if I change chairs. 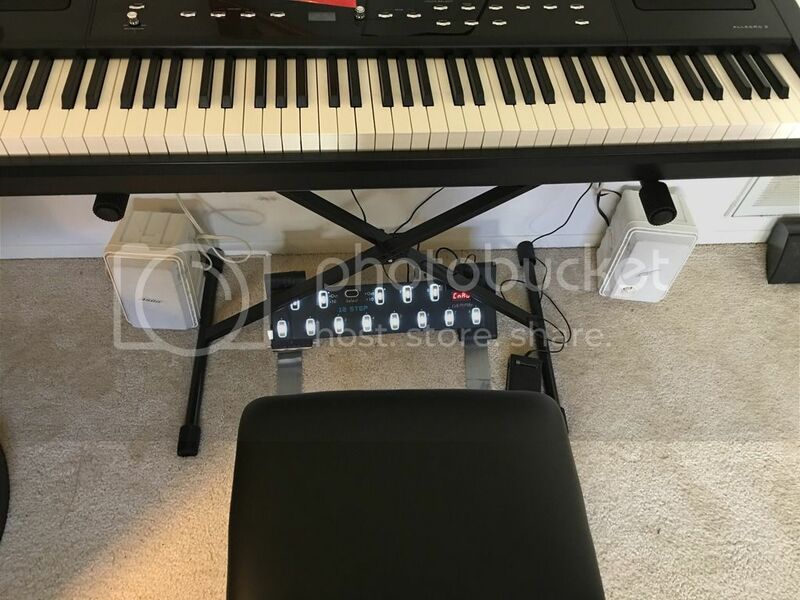 This can work underneath a keyboard using the piano stool on top of the strips to hold them down. Everything folds up so I can easily transport it and adjust it in the new setting. I marked off measurements from the end of the sitting part of the chair or stool so I keep it at the same distance and it is angled to the right as I like using my right foot.